Any system that provides its owner/user with a reasonable degree of protection against one or more real or imagined dangers, threats, or nuisances (such as physical attack, theft of property, unwanted human or animal intrusion, machine breakdown, or risks from fire, electric shock, or vermin infestation, etc.) can be described as a ‘security’ system. 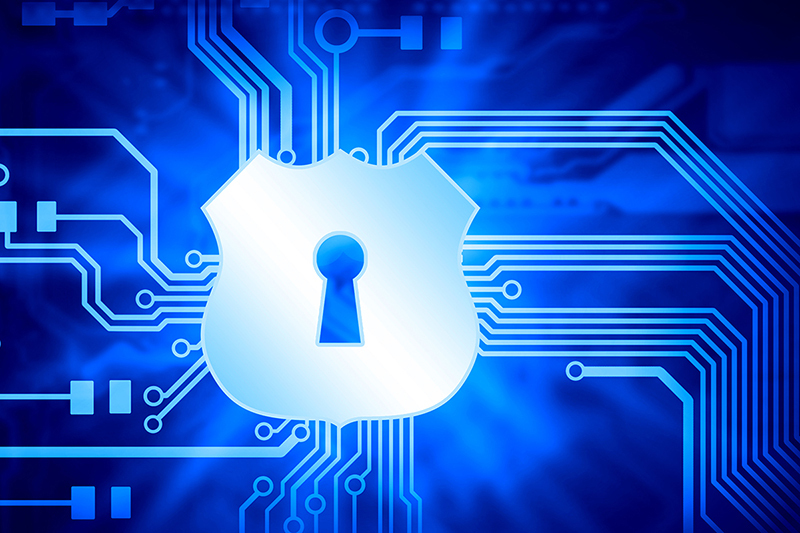 An ‘electronic’ security system is one in which the system’s actions are heavily dependent on electronic circuitry. Simple examples of such systems are electronic door bells and mouse traps, key-pad door locks, and domestic burglar alarms. This opening episode of this series starts off by explaining electronic security system basic principles and then goes on to describe a wide variety of devices that can be used within modern electronic security systems. This basic theme is continued in the next part of the series, but all subsequent episodes will show practical examples of various specific types of low- to medium-complexity electronic security systems and circuits. All electronic security systems consist of the basic elements shown in Figure 1. Here, one or more ‘danger’ sensing units are placed at the front of the system and generate some kind of electrical output when danger is sensed. The output of the sensor unit is fed, via a data link, to a decision-making signal processing unit, and this unit’s output is fed, via another data link, to a ‘danger’ response unit such as an alarm or an electromechanical trigger or shutdown device. FIGURE 1. Basic elements of an electronic security system. Note in Figure 1 that each of the system’s three major elements is shown using its own power supply, but that, in practice, two or more elements may share a single power supply. Figures 2 to 5 show, in basic form, four different low- to medium-complexity types of security system. The first of these (Figure 2) is a simple electronic door-bell or shop-entry alarm system, in which the ‘danger’ sensor is a push-button switch in the case of the door-bell system or a door-mounted microswitch (or a pressure mat switch, etc.) in the case of the shop-entry system. In both cases, the circuit action is such that when switch S1 closes it activates a timing generator that turns on an alarm sound generator for a period of 10 seconds, irrespective of the actual duration of the switch closure, and repeats this action each time that S1 is closed. Ideally, this type of circuit draws zero quiescent current. Note, in the case of the door-bell circuit, that the ‘danger’ sensor (S1) is operated voluntarily by the unknown visitor, in a deliberate effort to attract the attention of the householder, but that in the case of the shop-entry circuit, S1 is operated involuntarily by the visitor, and warns the shopkeeper of the presence of a potential customer or thief. 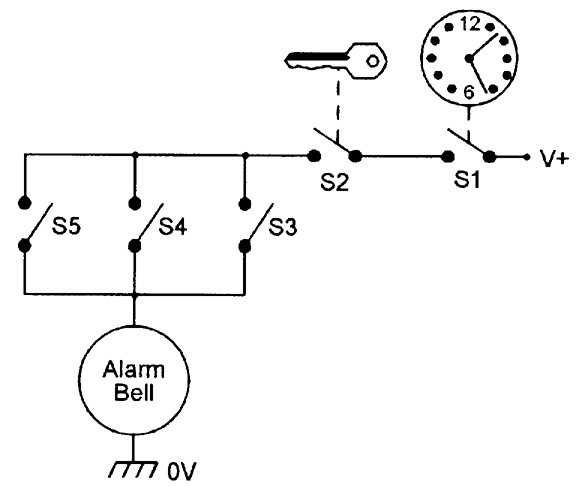 Figure 3 shows a simple domestic burglar alarm circuit. Here, the main alarm system is enabled by closing key-operated switch S2, and the S1 ‘danger’ sensor actually consists of any desired number of series-connected normally-closed switches (usually reed-and-magnet types) that are each wired to a protected door or window, so that the composite S1 switch opens when any protected door or window is opened or a break occurs in S1’s wiring. FIGURE 3. Simple domestic burglar alarm system. 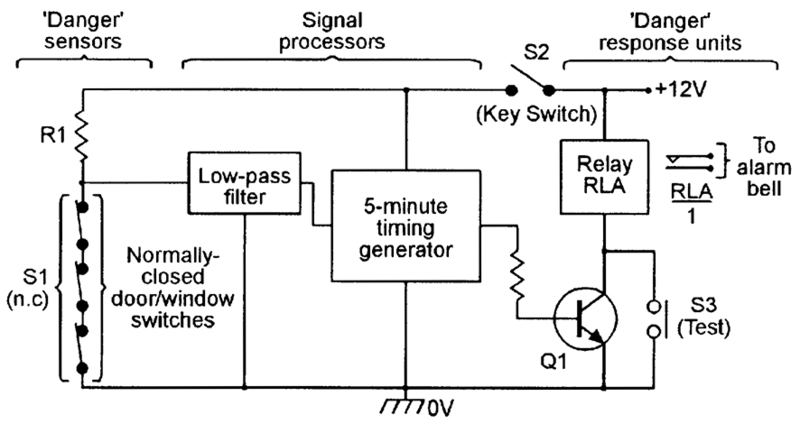 Under this condition, R1 pulls the input of the transient-suppressing low-pass filter high and, after a brief delay (usually about 200 mS), the filter output triggers the five-minute timer generator, which turns on relay RLA via transistor Q1 and thereby activates an external alarm bell or siren via the relay’s RLA/1 contacts. Once activated, the relay and alarm turn off automatically at the end of the five-minute timing period, but can be turned off or reset at any time by opening key-switch S2. The alarm can be tested at any time, with or without closing S2, via push-button switch S3, which closes RLA directly. Figure 4 shows, in pictorial form, a modern passive infrared (PIR) movement detector system that can be used to automatically sound an alarm or turn on floodlights when a person enters the PIR detection field (the PIR has a typical maximum range of 12 meters and the field has a vertical span of about 15 degrees and a horizontal span of 90 to 180 degrees). FIGURE 4. Passive infrared (PIR) movement detector system. The PIR unit detects the small amounts of infrared radiation generated by human body heat, but gives an ‘alarm’ output only when the heat source moves significantly within the detection field. Most PIR units have good immunity to false alarms; some types incorporate an output relay that is normally closed (turned on), but opens (turns off) when an intruder is detected or the unit’s power supply fails or is removed; units of this latter type typically need a 12V DC supply and consume a quiescent current of about 20 mA. PIR units are widely used to give room or area protection in modern burglar alarm systems. Figure 5 shows — in simplified form — the basic elements of a modern domestic ‘wireless’ burglar alarm system, in which the data links between the various major parts of the system take the form of a coded RF (usually 418 MHz or 458 MHz) signal, thus greatly easing installation problems. FIGURE 5. Wireless burglar alarm system. The heart of the system is the main control panel, which houses a wireless receiver and decoder and control logic, plus a high-power mini-siren, and has an output that can activate an external high-power siren and light-strobe alarm unit. The system’s ‘danger’ sensing units each house a small RF transmitter and antenna that send out a coded signal under a danger condition; each of the units are designed to give a minimum of six months of normal operation from a small battery. Most domestic wireless burglar alarm systems can be used to monitor a maximum of four to six zones (individual protected areas) via suitable sensing units. The sensing units come in three basic types: ‘contact-switch’ types transmit a danger signal when one or more series-connected normally-closed switches are opened, and can be used to protect a zone of any desired size; ‘PIR’ types transmit a danger signal when a human moves within the visual field of the PIR unit, and can be used to protect a zone of limited size; ‘panic’ types transmit a danger signal when a key-fob button is pressed, and can be used to protect a person against sudden physical attack or threat whenever they are within communication range of the system’s receiver (control panel) unit. All three types of sensing units also send out monitoring signals that give warnings of failing battery power or deliberate interference, etc., and the wireless burglar alarm system thus offers a high degree of security. 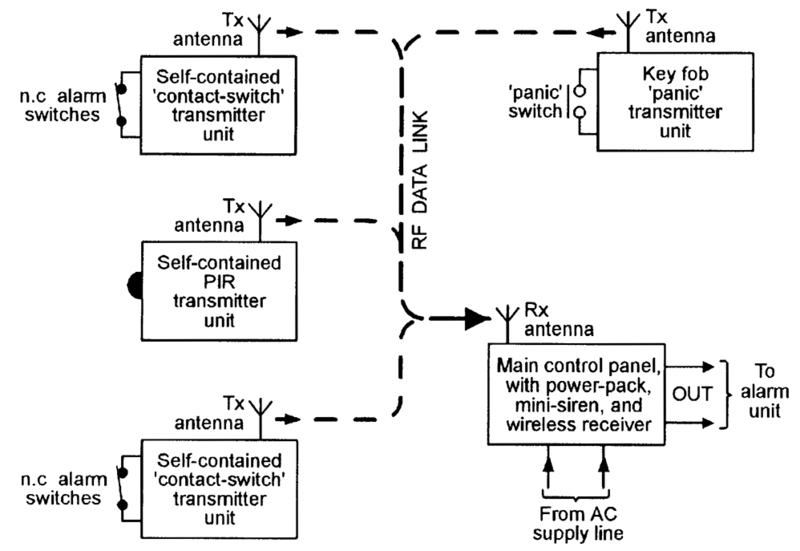 Note that simple electronic security systems such as those shown in Figures 2 and 3 can be easily and cheaply built on a DIY basis, but that it is not cost-effective to build a PIR unit of the Figure 4 type as a DIY project, or cost-effective or legal (because the RF transmitters must be certified by an approved state or national body) to build (rather than buy) a Figure 5 type of wireless burglar alarm system as a pure DIY project. Commercial PIR units and wireless burglar alarm units can, however, easily be used as special elements that can be incorporated in a wide variety of DIY security systems. The most important parameter of any practical electronic security system is its reliability in performing its designated task. Specifically, all such systems must be easy to use, difficult to disable, and have good immunity against malfunctioning and the generation of false alarms (which very quickly destroy the user’s confidence in the system). The degree and types of reliability required from a security system vary with the level of security that the system is designed to provide. Domestic burglar alarm systems (in which only a few family members have access to the major functional parts of the system) have, for example, relatively low anti-tamper requirements, but anti-burglary systems used in large shops and stores — in which the public has easy access to many protected areas during normal ‘opening’ hours — have very high levels of anti-tamper requirement. The overall reliability of any electronic security system is greatly influenced by the nature of its major system elements, i.e., by its danger sensing units and its data links, etc. Simple electromechanical danger sensors such as reed-switches and pressure pad switches have, for example, far greater intrinsic levels of reliabilty than electronic sensors such as ultrasonic, microwave, and simple light-beam intrusion detectors, but electronic key-pad security switches usually have far greater reliability than the mechanical key switches that they are designed to replace, and so on. 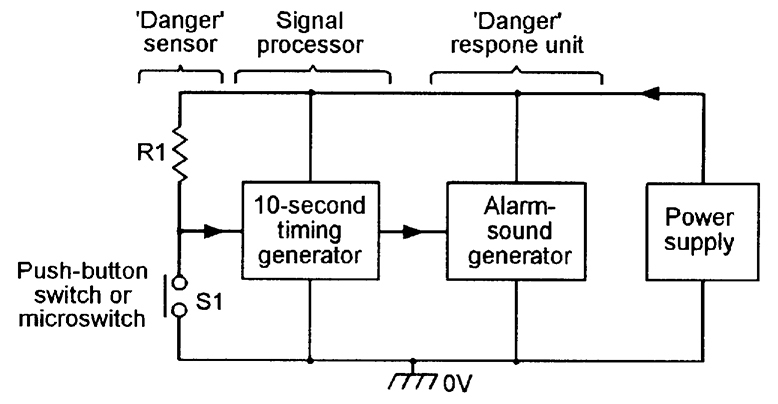 All electronic security systems consist — as shown in Figure 1 — of one or more ‘danger’ sensing units that generate some kind of electrical output when danger is sensed, and which feed that output — via a data link and a decision-making signal processing unit — to a ‘danger’ response unit such as an alarm or an electromechanical trigger or shutdown device. Apart from the actual signal processing unit, the three other major elements of any electronic security system are thus the sensing unit, the data link, and the response unit, and each of these elements may take an electro-mechanical, electrical, or an electronic form. Each of these three basic elements are available in a variety of guises, and the most important of these is described in the remaining sections of this chapter. The simplest and most widely used electromechanical sensors are ordinary electrical switches of the various types shown in Figures 6(a) to 6(e). The types shown in (a) to (d) are linear pressure-operated types, and may take normal manually-operated forms, or may be microswitches that are activated by the mechanical movement of a door, window, or machine part, etc. The (e) type is a rotary multi-step, pressure-operated switch that is (normally) activated manually. FIGURE 6. Five basic switch configurations. The sensor shown in (a) is a normally-open (NO or n.o.) 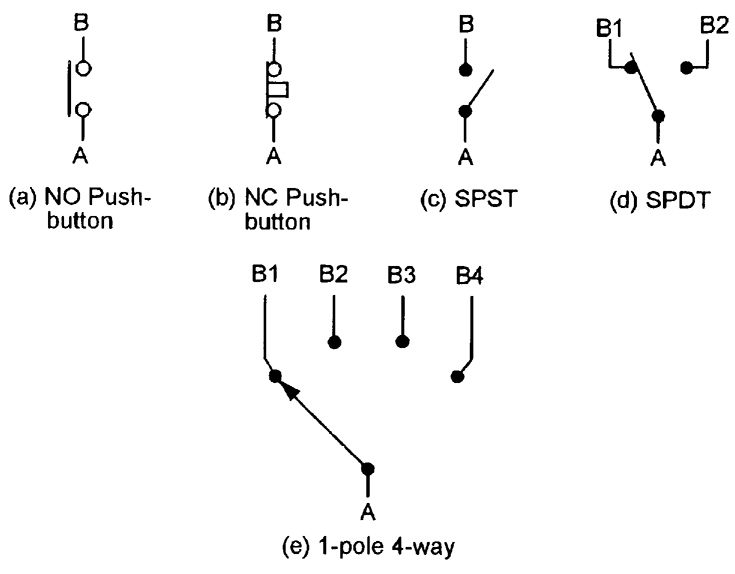 push-button switch; (b) is a normally-closed (NC or n.c.) push-button switch;, (c) is a single-throw single-pole (SPST) toggle switch, (d) is a single-pole double-throw (SPDT) or ‘change-over’ toggle switch; and (e) is a single-pole four-way rotary switch. Figure 7 shows three basic ways of using normal electrical switches in power (or signal) switching applications. 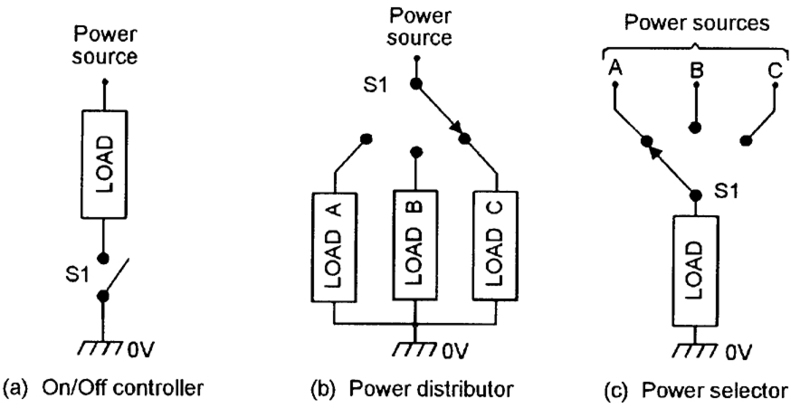 In (a), a SPST switch is used as an on/off controller to switch power to a single load; in (b) a one-pole, three-way switch is used as a power distributor to switch power to any one of three loads; and in (c) is used as a power selector, to connect any one of three power sources to a single load. FIGURE 7. Three basic types of power (or signal) switching circuit. Switched-output electromechanical sensors are available in a variety of basic types, including temperature-sensitive thermostats, orientation-sensitive ‘tilt’ and ‘tip-over’ switches, pressure-sensitive ‘mat’ switches, key-operated security switches, and time-sensitive ‘timer’ switches, all of which are shown in basic form in Figures 8 to 10. Thermostats are temperature-activated on/off switches that usually work on the ‘bimetal’ principle illustrated in Figure 8(a), in which the bimetal strip consists of two bonded layers of conductive metal with different coefficients of thermal expansion, thus causing the strip to bend in proportion to temperature and to make (or break) physical and electrical contact with a fixed switch contact at a specific temperature. FIGURE 8. Basic construction of a simple bimetal thermostat (a), and symbols for (b) fixed and (c) variable thermostats. In practice, the bimetal element may be in strip, coiled, or snap-action conical disc form, depending on the application, and the thermal ‘trip’ point may or may not be adjustable. Figures 8(b) and (c) show the symbols used to represent fixed and variable thermostats. A variety of thermostats are readily available, and can easily be used in automatic temperature control or danger-warning (fire or frost) applications. Their main disadvantage is that they suffer from hysteresis; typically, a good quality adjusted thermostat may close when the temperature rises to (say) 21°C, but not re-open again until it falls to 19.5°C. Figure 9(a) illustrates the basic construction and operating principle of a mercury tilt switch, which (in this example) consists of a cigar-shaped cavity that is formed within a block made of two electrically-connected metal end contacts and a central metal contact, which are separated by insulating sections. FIGURE 9. Basic construction of mercury tilt (a) and tip-over (b) switches. The cavity holds a mercury globule, which rests on the central contact, but is insulated from the end contacts when the switch is horizontal, but rolls and touches one or the other of the end contacts (and also the central contact) if the switch is tilted significantly (typically by more that 10 degrees) out of the horizontal. The mercury ‘switch’ is thus normally open, but closes when tilted, and can be used to activate an alarm if an attempt is made to move a normally-stationary protected item such as a TV, PC, or hi-fi unit, etc. Figure 9(b) illustrates the basic construction and operating principle of a mercury tip-over safety switch. In this case, the cavity is fairly steep-sided, and the construction is such that the mercury globule touches both a ring contact and a center contact when the unit is vertical, and thus acts as a closed switch, but breaks this contact and acts as an open switch when the unit is tilted heavily (typically by more than 40 degrees) out of the vertical position. One common application of this type of switch is in free-standing electric heaters, where the switch is built into the unit and wired in series with its power lead, so that the appliance automatically turns off if it is accidentally knocked over. Figures 10(a) and 10(b) illustrate the general appearance and basic construction of a pressure mat switch, which is designed to be hidden under a mat or carpet, and acts as a normally-open switch that closes if a person steps heavily on any part of the switch. FIGURE 10. 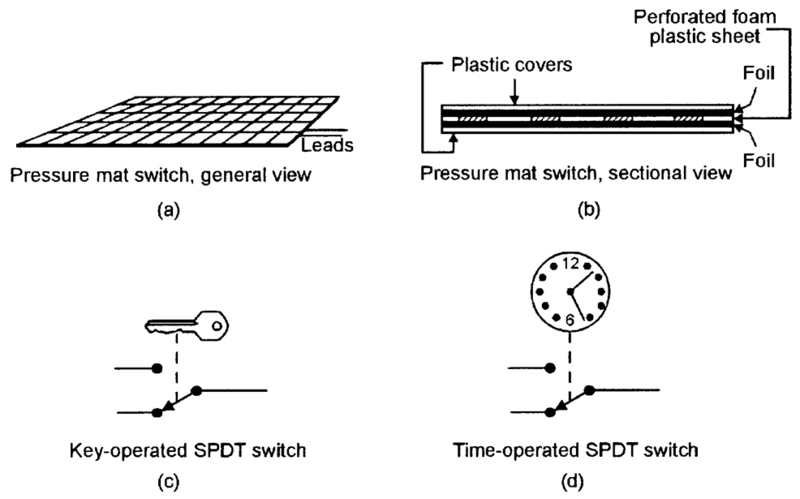 General (a) and sectional (b) views of a pressure mat switch, and symbolic representations of (c) key-operated and (d) time-operated SPDT switches. The device consists of two sheets of metal foil that are normally held apart by a perforated sheet of foam plastic; this sandwich is encased in a hermetically sealed plastic envelope; when a person treads on the envelope their weight compresses the foam plastic, and the metal foils make electrical contact via the foam sheet’s perforations. Pressure mat switches are widely used in domestic and commercial burglar alarm systems; most such switches have four output wires; the two ‘switch’ wires have partly-bared ends. The other two wires are not bared, are internally shorted together, and serve an n.c. anti-tamper function in which an alarm system activates if the sensor wiring is cut (this technique is described in the DATA LINKS section of the next eposode of this series), and can be ignored in most domestic applications. Figure 10(c) shows a symbolic representation of a simple key-operated SPST electric switch, in which the switch arm is moved by turning a Yale-type key in a matching tumbler mechanism. Switches of this basic type are available in many different switch and key-type styles, and are widely used in security applications in buildings and vehicles, and on items such as PCs and burglar alarm control units. The most important parameter of a key switch (or of any type of key-operated lock) is its number of ‘differs’ or possible key profiles; Yale-type switches have a number of pins (usually five) which must each be raised to a certain level by the key to allow the switch to operate. Usually, each pin has three possible levels, and a simple five-pin key switch thus has 243 (= 35) differs; if the key’s shaft also carries two long grooves that must match the lock’s face plate and offer (say) a further nine differs, the total number of differs is raised to 2187. Figure 10(d) shows a symbolic representation of a simple analog time-operated SPST electric switch, in which the switch arm is moved by a mechanical (clockwork or slow-release), electrical (current-heated thermostat), or electromechanical (synchronous motor plus gearbox) timing mechanism. Switches of this basic type are available in many different switch styles, with many different timing ranges, and are widely used in light-switching and solenoid-operating security applications. One of the most useful types of switched-output electro-mechanical sensor devices is the ‘reed’ switch, which activates in the presence of a suitable magnetic field and is particularly useful in proximity-detector applications. FIGURE 11. Basic structure of a reed switch. Figure 11 shows the basic structure of a reed switch, which consists of a springy pair of opposite-polarity magnetic reeds with plated low-resistant contacts, sealed into a glass tube filled with protective gasses. The opposing magnetic fields of the reeds normally hold their contacts apart, so they act as an open switch, but these fields can by nulled or reversed by placing the reeds within an externally-generated magnetic field (see Figure 12), so that the reed then acts as a closed switch. FIGURE 12. 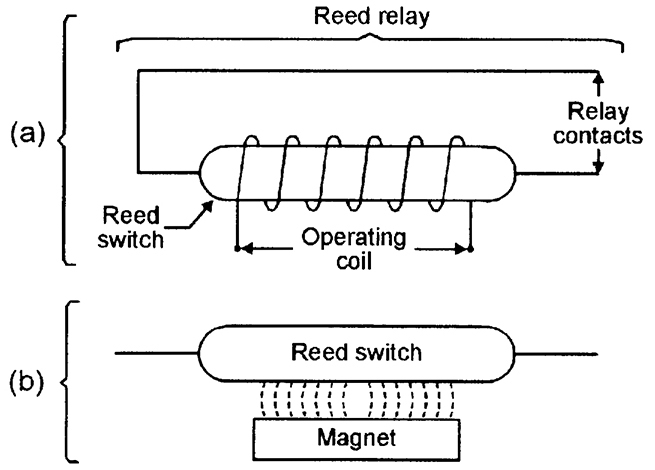 Reed switch operated by (a) coil or (b) magnet. 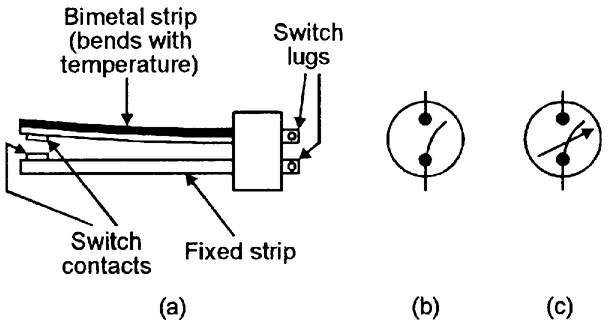 A reed switch can be activated by placing its reeds within an externally-generated magnetic field, which can be derived from either an electric coil that surrounds the glass tube, as in the ‘reed relay’ diagram of Figure 12(a), or by a permanent magnet placed within a few millimeters of the tube, as shown in Figure 12(b). Reed relays are used in the same way as normal relays, but typically have a drive-current sensitivity 10 times better than a standard relay. Reed-and-magnet combinations are very useful in proximity-detector applications in security and safety systems, etc., as illustrated in Figure 13. FIGURE 13. Method of using a reed switch/magnet combination to give burglar protection to a door or window. Figure 13 shows a method of using a reed and magnet to give burglar protection to a door or window. Here, the reed switch is embedded in a door or window frame, and the activating magnet is embedded adjacent to it in the actual door or window so that the reed switch changes state whenever the door/window is opened or closed. The reed switch can thus be used to activate an alarm circuit whenever a protected door/window is opened. In practice, the reed and magnet may take the basic forms shown in Figure 12(b), or may be encapsulated in special housings that can easily be screwed to — or embedded in — the frame/body of the door/window. Several switched-output sensor devices can be used to activate an alarm bell or other device by connecting them in one or other of the basic modes shown in Figure 14. In (a), the switches are wired in series and the alarm thus sounds only when all three switches are closed at the same moment. In (b), the switches are wired in parallel and the alarm sounds when any switch is closed. FIGURE 14. 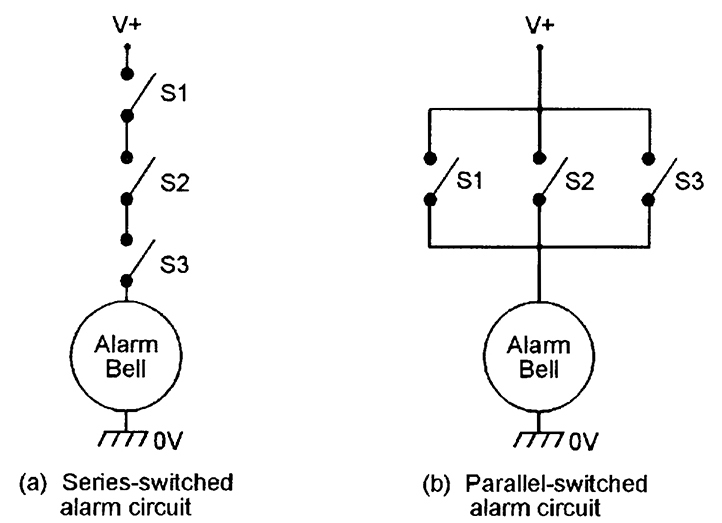 An alarm bell can be activated by several switches wired (a) in series or (b) in parallel. In most practical alarm systems, a mixture of series and parallel switching is used, as shown in the example of Figure 15. Here, the alarm system is enabled (made alert) by closing series-connected time switch S1 and key switch S2; once enabled, the alarm bell can be activated by closing any of the parallel-connected S3 to S5 switches. FIGURE 15. Simple security alarm, using a combination of series- and parallel-connected switches. In burglar alarm systems, important intrusion-sensing switches should be n.c. types that are wired in series and used in the basic manner already shown in Figure 3, so that the alarm activates if any switch opens or if its wires are cut; R1 should have a high value (typically several megohms) to give low quiescent current consumption. A thermistor is a passive resistor device with a resistance value that is highly sensitive to the device’s temperature. Practical thermistors are available in rod, disc, and bead forms, and with either positive or negative temperature coefficients (known as PTC and NTC types, respectively). Unlike electromechanical thermostats, they do not suffer from hysteresis problems, and are thus suitable for use in a variety of precision temperature sensing and switching applications. FIGURE 16. Symbols commonly used to represent a thermistor. Figure 16 shows two alternative symbols that can be used to represent a thermistor. In most practical applications, thermistors are used in conjunction with electronic circuitry that gives a switch-type output when the thermistor temperature goes above (or below) a pre-set limit. Thermistors have typical operating temperature ranges of -40°C to +125°C. When a junction is formed between two dissimilar metals, a thermo-electric (temperature-dependent) voltage is generated across the junction. Thermocouples are devices in which the two types of metal are chosen to exploit this effect for temperature-measurement purposes; a device using a copper and copper-nickel junction, for example, has a useful ‘measurement’ range from -100°C to +250°C and has a typical sensitivity of 42 µV per °C over the positive part of that range. Some devices using other types of metal have useful measurement ranges that extend above +1100°C. FIGURE 17. Symbols of (a) a conventional and (b) an electrically-heated thermocouple device. Figure 17(a) shows the symbol used to denote a normal thermocouple. In some special types of thermocouple devices, the junction can be heated via a DC or RF current passed through a pair of input terminals, and the unit’s output can then be used to indicate the magnitude of the input current or power; units of this type use the symbol shown in Figure 17(b). An LDR (also known as a cadmium sulphide (CdS) photocell) is a passive device with a resistance that varies with visible-light intensity. FIGURE 18. LDR symbol (a) and basic structure (b). 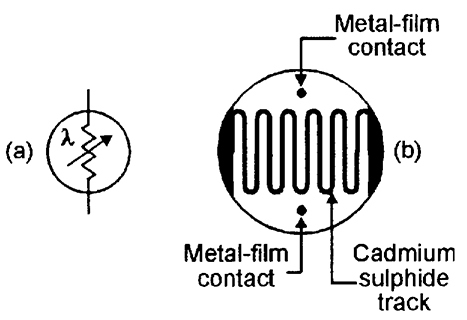 Figure 18 shows the device’s circuit symbol and basic construction, which consists of a pair of metal film contacts separated by a snake-like track of light-sensitive cadmium sulphide film; the structure is housed in a clear plastic or resin case. FIGURE 19. Typical characteristics curve of an LDR with a 10 mm face diameter. 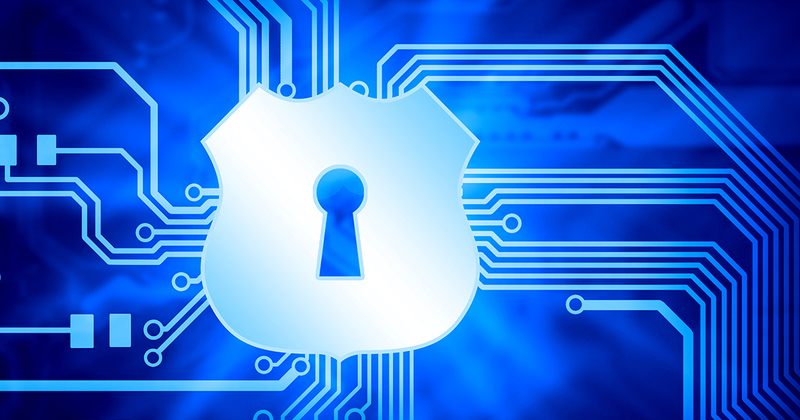 LDRs have many practical applications in security and auto-control systems. 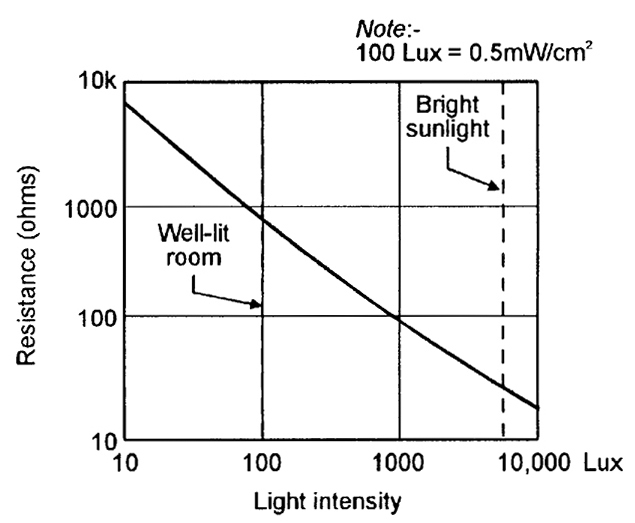 Figure 19 shows the typical photoresistive graph that applies to an LDR with a face diameter of about 10 mm; the resistance may be several megohms under dark conditions, falling to about 900R at a light intensity of 100 Lux (typical of a well-lit room) or about 30R at 8000 Lux (typical of bright sunlight). Microphones are acoustic-to-electrical transducers and have a number of uses in eavesdropping and other security applications. The three best known types of electrical microphones are the moving-coil (‘dynamic’), ribbon, and piezo-electric (‘crystal’) types. In most security electronics applications, microphones are required to be small but sensitive types that generate medium-fidelity outputs; electronic ‘electret’ microphones are widely used in such applications.